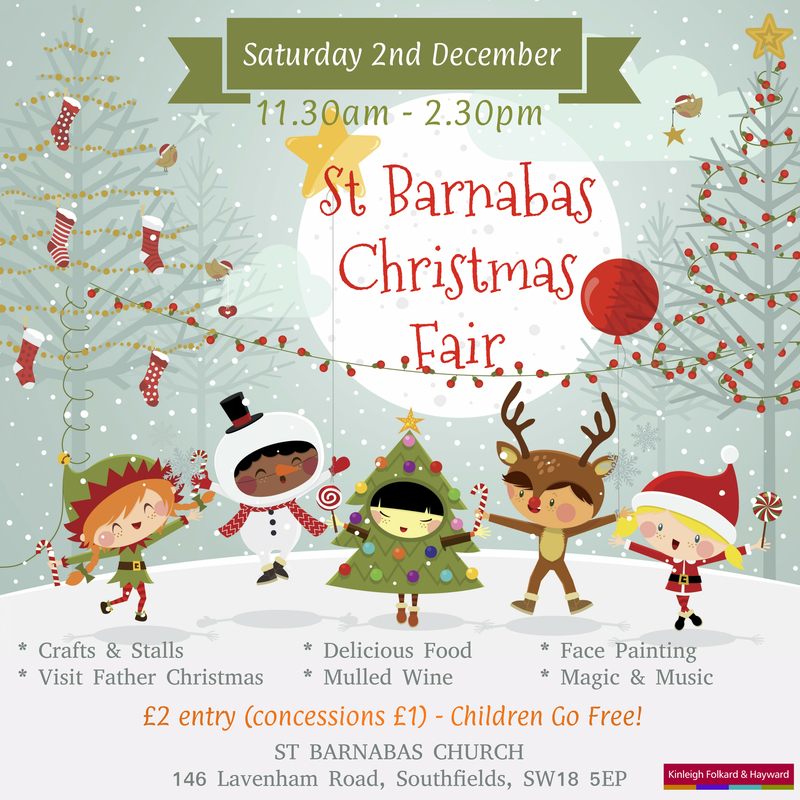 Please bring your friends and family and join us at the 2017 St Barnabas Christmas Fair on Saturday 2nd December. 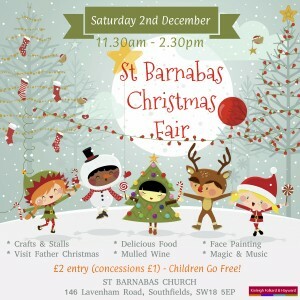 Come to visit our gift stalls, indulge in some delicious food and drink, and entertain the family with magic and music! Entry £2 (£1 concessions) and kids go free. Join us this Saturday 30th September for Southfields Harvest at St Barnabas Church. What’s happening and who’s coming? EAT: The Rocky Head Brewery, Sue & John from Salt & Pepper (cooking with as much local fruit and veg they can lay their hands on) and judging cakes too. 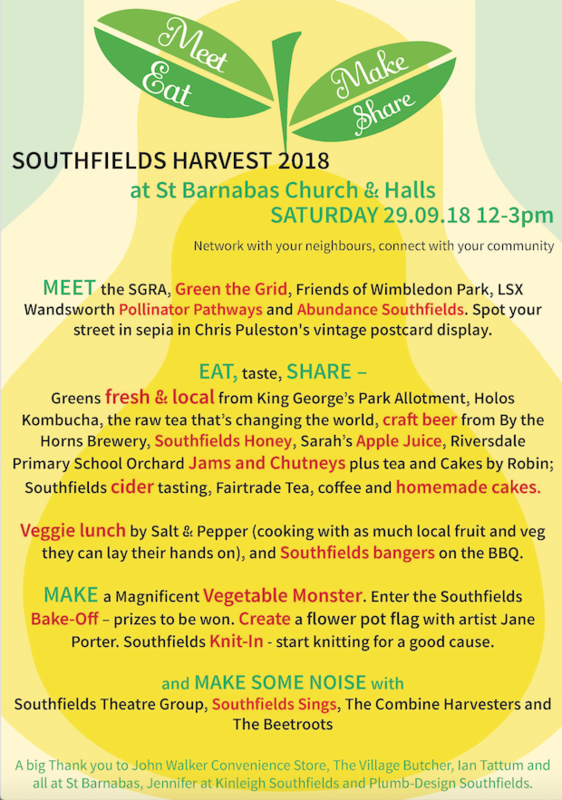 The incomparable Southfields Sausage on the BBQ, lovely honey from industrious Southfields bees, gorgeous jams from Claire Lewis, apple juicing at the Abundance community fruit press (bring your own fruit), plus bottled SW18 juice to buy. Fairtrade tea, coffee and cake. MEET: Jane Porter, artist and illustrator; the Friends of Wimbledon Park; growers from King George’s Park Allotments; the Southfields Grid Residents Association; the Southfields Theatre Group; the Rocky Head Brewery; man of ideas, Leon Conrad. Listen to local band, the Combine Harvesters and Southfields Sings choir. SHARE: Your apples, your allotment vegetables and your home baking. Free to attend. Please use the entrance on Merton Road. For more information, please visit http://southfieldsharvest.weebly.com. 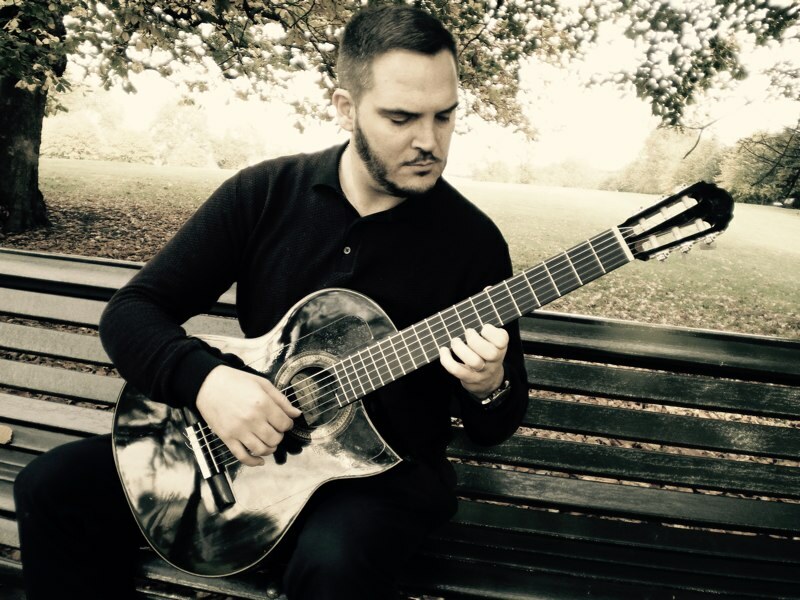 Join us at St Johns the Divine in Earlsfield on Saturday 23rd September at 7pm to hear Matthew Sear play Bach, Weiss and Barrios alongside his own compositions. 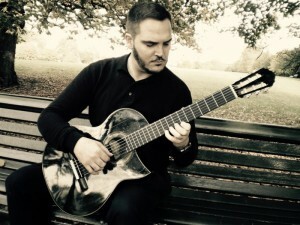 London-born musician Matthew Sear is a guitarist and composer noted for performances and compositions that borrow from a variety of musical traditions. Tickets are £10 on the door, or £5 for concessions. 4 pm 24th December: Nativity Service. 11.30 pm Midnight Mass. With Carols. 10.30 am Christmas Day: Eucharist with Carols. 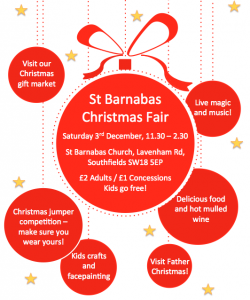 Announcing the 2016 St Barnabas Christmas Fair! We will be holding our Christmas Fair on Saturday 3rd December, from 11.30am to 2.30pm. This family event offers plenty of festive fun, from our live entertainment, tombolas and raffles, kids activities and much more! 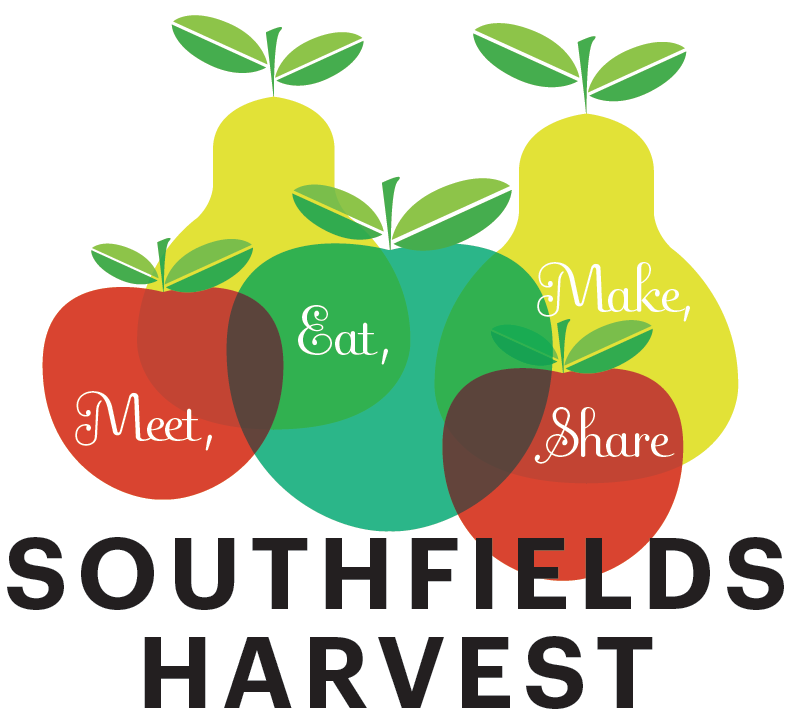 Southfields Harvest, save the date! Southfields Harvest is coming to St Barnabas on Saturday 1st October, noon – 3pm. Join us for an afternoon of good food and drink, and a display of Southfields’ finest culinary talent (prizes will be given for showstopping cakes, jams and chutneys). Also includes music to set your feet tapping, craft beer, honey and produce, BBQ, apple juicing, cake, knitting and merriment. To add to the excitement, the Big Draw festival will be coming to Southfields Harvest. Put your imagination to work to create the Great Big Southfields Combine Harvester with Southfields artist and illustrator, Jane Porter – a community event for young and old. Following our first two concerts (Celebrating Women Composers and Music, Landscape and Myth in Scandinavia), we are delighted to announce a new concert into our summer series, to be held on Monday 20th June at 7.30pm. The talented Iuventus Ensemble are set to deliver a passionate and warm performance of the Dohnanyi Serenade in C major, Opus 10 and Schubert Octet in F major, D803. Tickets are £15 (£10 concessions / £5 for under 16s) on the door, and include complimentary refreshments in the interval. We hope that you can join us for this event. Oboist Julia White, cellist Mayda Narvey and guitarist Matthew Sear play an intimate and beguiling programme of Baroque and Spanish music with readings by Darris Golinski reflecting on the power of music to heal and restore. Tickets are £10 (£8 concessions / £5 for under 16s). Soprano Lene Sahlhodt and jazz pianist Chad Lelong join cellist Mayda Narvey in a summer cabaret of jazz, both standard and rather off the beaten track. With readings by Jazz FM presenter / performer, Bob Sinfield. Tickets are £10 (£8 concessions / £5 for under 16s). Arrival: Tea Coffee and pastries available from 9.45.